Cincinnati was the main setting and filming location for George Clooney's political drama The Ides of March (2011). Clooney, who played one of the main characters and also directed this film, is a local of the area. Born in nearby Lexington, Kentucky, he went to school in Fort Mitchell – a small town just opposite Cincinnati, on the other side of the Ohio River in Kentucky. George Clooney's famous aunt – singer and actress Rosemary Clooney – can be seen on a mural that you will pass by on the Sweet Stroll Food Tour through Cincinnati's "Over‐the‐Rhine" neighbourhood. 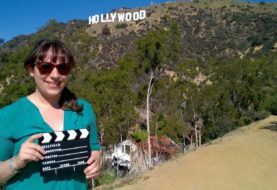 For more recent movies shot in the area and to find out what is filming in Cincinnati right now, check out the website of the Cincinnati Film Commission. The filming locations for The Ides of March include the city's most famous landmarks, so you could easily combine your Cincinnati sightseeing tour with a self‐guided film locations tour for The Ides of March. As Cincinnati is a large city with very limited public transport options, I would recommend to drive to these places (either with your own car or a rental). Cincinnati is an all‐year destination. 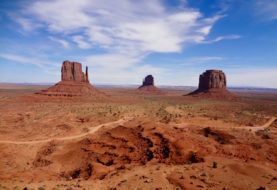 However, the city has a continental climate, so the summers can get hot and the winters cold. My tip: Come in spring or early summer (March‐June). Although I had a bit of bad luck with a few days of rain on my most recent visit in May 2017, I also enjoyed some beautiful sunny days with beautifully blossoming flowers around every corner (for example on my Sweet Stroll Food Tour). Cincinnati is still pretty much a car‐based city. But if you don't come with your own or a rental car, you can always use app‐based driver services such as Uber, which is now readily available throughout the city. There is also a new little tram in the city centre, although I've never tried it when I was there. For more info on this, go to Cincinnati's Official Visitor Center located on Fountain Square in Downtown (511 Walnut Street, Cincinnati, Ohio 45202). Cincinnati also has a train station, from where you can catch an Amtrak train to other major cities in the US. Furthermore, Greyhound and Megabus bus services offer connections to several big cities throughout the Midwest and beyond. Guided tours are a great way to get a first overview of a new city or to explore a new neighbourhood in more depth. My favourite Cincinnati tour was the so‐called "Sweet Stroll". The food tour offered by Cincinnati Food Tours will take you through Cincinnati's currently most up‐and‐coming neighbourhood "Over‐the‐Rhine" and includes samples of seven delicious sweet treats, including a donut and a speciality drink. 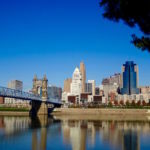 Learn more about the rich German heritage in Cincinnati on a tour through Cincinnati's historic district "Over‐the‐Rhine"
Cincinnati was also a pretty infamous "hot spot" for mobsters during the era of prohibition. You can find out more about Cincinnati's mobster history on the Newport Gangster Tour in Newport, Kentucky (Newport is just a short, about ten‐minute drive away from Downtown Cincinnati). The tour company American Legacy Tours also offers a range of other historic walking tours, for example an underground tour of Cincinnati's "hidden city". Gangster Guide on the "Newport Gangster Tour"
1. Since Kentucky has a lower hotel tax than Ohio (11,3 % in Kentucky compared to 17% in Ohio), it makes sense for budget travellers to stay in a hotel on the other side of the river. 2. Driving or walking over the Roebling Suspension Bridge, with connects Downtown Cincinnati with Convington, Kentucky, is quite an experience. The beautiful bridge, completed in 1876, was in fact the forerunner of the famous Brooklyn Bridge in New York (designed and built by the same architect: German‐born John Roebling). With a short drive to the east of Downtown, you'll get to Mount Adams. In this elevated area right by the Ohio River, you will find the Cincinnati Art Museum, Eden Park and Krohn Conservatory – a huge greenhouse with a beautiful butterfly exhibition during the season. Like in many other American cities, Downtown is the main financial centre and shopping district of Cincinnati. You'll have a great view at the impressive Cincinnati skyline from the Carew Tower Observation Deck. It's almost like the view from the Empire State Building or Top of The Rock in New York City – minus the crows of tourists and also a lot cheaper (entry is just 4 Dollars for adults, cash only). 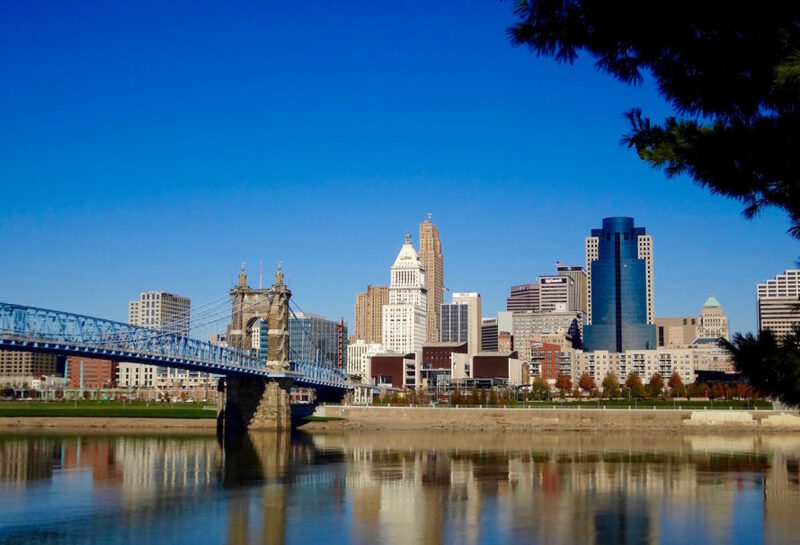 The Sweet Stroll Tour by Cincinnati Food Tours will take you through Cincinnati's currently most up‐and‐coming area an most intact historic district: the so‐called "Over‐the‐Rhine" neighbourhood. As you can see from the name, this neighbourhood is also a quintessentially German one. As such, the neighbourhood celebrates various German holidays and traditions and you will find plenty of themed shops, restaurants and bars here. Residential houses in the Covington's "MainStrasse Village"
Cincinnati was an important part of the Underground Railroad, a network which helped African‐American slaves escape to the free North during the early‐to‐mid 19th century. Learn more about the history of freedom at this great museum. Located next to Cincinnati's main train station, Union Terminal, this is where you should head if you would like to learn more about Cincinnati's versatile history. As of 2017, the Museum of Natural History & Science, Cincinnati History Museum, and the OMNIMAX ® Theater are closed for restoration and repair. However, the Duke Energy Children's Museum and a special exhibits hall, currently hosting a movie exhibition called Star Wars™ and the Power of Costume, will remain open throughout the process. As a city with such a rich German heritage, it is not too surprising that Cincinnati hosts its own Oktoberfest every year in September. By the way, the Oktoberfest Zinzinnati is in fact the largest Oktoberfest in America. Since I stayed with relatives, I am not too familiar with accommodation options in Cincinnati. But since the hotel tax is lower in Kentucky it probably makes sense for budget travellers to stay on that side of the river. For example at the Holiday Inn Express in Newport. And even the fancy Millennium Hotel in Downtown Cincinnati (one of the filming locations for The Ides of March, see above) as they offer good deals from time to time. Alternatively, AirBnB offer some great "homes away from home" in the greater Cincinnati area. If you've never booked an AirBnB before, just click on this link and I'll give you 41 US Dollars off your first booking! Cincinnati is famous for its so‐called Cincinnati Chili. A lot less spicy than it sounds, this "chili" consists of a meat‐ or tofu based sauce with a secret chocolate ingredient. Aside from Cincinnati, you cannot get this kind of "chili" anywhere else in the US. There are several Chili chains. The most famous among them is probably "Skyline Chili" – again a restaurant chain that you will only find in the wider Cincinnati area. Meals here are very affordable and come with speedy service. You can even see how your meal is prepared at the front‐of‐store cooking station. 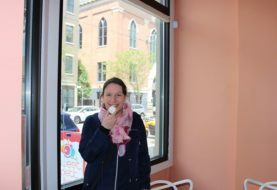 If you want to combine trying the local specialties of Cincinnati with learning about the city's history, go on one of the guided food tours offered by Cincinnati Food Tours. Yummy donuts on the "Cincinnati Sweet Stroll Tour"
Finally, my restaurant tip for Cincinnati is the Incline Public House. Located on top of Price Hill, you'll have a great view over Downtown Cincinnati from here. Make reservations as the restaurant gets very popular.